I'm Allan and I'm hosting the "Last Chance Sumo Tickets" experience here on Voyagin. Sumo is a really great experience which I first enjoyed way back in the last Millennium when Japan's Takanohana and Wakanohana brothers were the Yokozuna fighting against the huge Hawaiian Yokozuna Akebono and Mushashimaru! 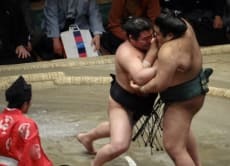 A lot has changed in the sumo world since then of course and now the Age of Hawaiian wrestlers has been replaced by the Age of Mongolian Wrestlers. Last Chance Fight Day Tokyo Sumo Championship Tickets!